We have a new Cabinet! But what is it? And why isn’t it in the Constitution? The Cabinet is made up of senior ministers of the government and is headed by the Prime Minister, who also chairs its meetings. Cabinet is a centrally important part of government as it makes decisions on national policy issues and proposes new laws. Cabinet is responsible to Parliament, which examines the decisions and proposals emanating from it during Question Time in the House of Representatives and the Senate. Up until 1956, all ministers were Cabinet members but as their numbers and portfolios (areas of responsibility) grew after the Second World War, Prime Minister Robert Menzies introduced a two-tiered system with only senior ministers in the Cabinet. The ‘outer ministry’ consists of junior ministers with less important, or more specific, responsibilities. The one exception was the period of the Whitlam Government (1972-1975) when all ministers were members of the Cabinet. The third Whitlam Ministry consisted of 30 members plus the Prime Minister. The Australian Constitution does not recognize the Cabinet as a legal entity, so all Cabinet members also belong to the Executive Council which is chaired by the Governor-General, and which meets to endorse and give legal force to decisions already made by the Cabinet. Currently, the Federal Cabinet comprises 21 ministers, including Prime Minister Malcolm Turnbull. The outer ministry is made up of nine members of parliament, and Prime Minister Turnbull has introduced ‘assistant ministers’ who were previously known as parliamentary secretaries. There are 12 assistant ministers, including the first Indigenous Member of Parliament to attain that rank, Ken Wyatt, and the youngest member, Wyatt Roy, who is 25. The Turnbull Cabinet has five women in it. This figure has only been higher on one occasion when, in July 2013, Prime Minister Kevin Rudd appointed six women to the Cabinet. There were also five women in the Cabinet under Prime Minister Julia Gillard (2011-2013). The Cabinet of Prime Minister Tony Abbott (2013-2015), which preceded Turnbull’s, had only one woman member. This aroused controversy and was seen as a ‘throw-back’ to the twentieth century level of female representation in Cabinet. Of 57 ministries during the twentieth century, only seven had women as Cabinet members. For the first 76 years of that century there were no women with a portfolio of Cabinet rank. In July 1976 this changed with the appointment to Cabinet of Margaret Guilfoyle. She became the first woman to administer a government department and be a member of the Cabinet during her term as Minister for Social Security from December 1975 to 1980. Before Guilfoyle there was Annabelle Rankin, the first woman minister responsible for a government department as Minister for Housing from 1966 to 1971 — but this portfolio did not have cabinet rank. they only wanted me to pour the tea. After 1976 there was usually just one woman per Cabinet (though none in 1988-90). A ‘breakthrough’ occurred in 1996-1997 when Prime Minister John Howard appointed two women to his Cabinet — the highest number in Cabinet since federation. Things are certainly changing! Since 2001, 36 Cabinet appointments have been filled by 17 women. Amanda Vanstone was a member of four Cabinets and Tanya Plibersek served in three. Other notable Cabinet records relate to the length of time served. William McMahon holds the record for the longest unbroken period of service as a minister. From 1951 to 1972, he held a total of ten portfolios, including Vice President of the Executive Council and Treasurer. From 1971 to 1972, he was Prime Minister. The shortest duration goes to Glen Sheil who was a minister for just two days. Sworn in as Minister for Veterans Affairs in the government led by Prime Minister Malcolm Fraser on 20 December 1977, his appointment was terminated at Fraser’s instigation on the 21st after he made public statements in support of South Africa’s racist apartheid regime. 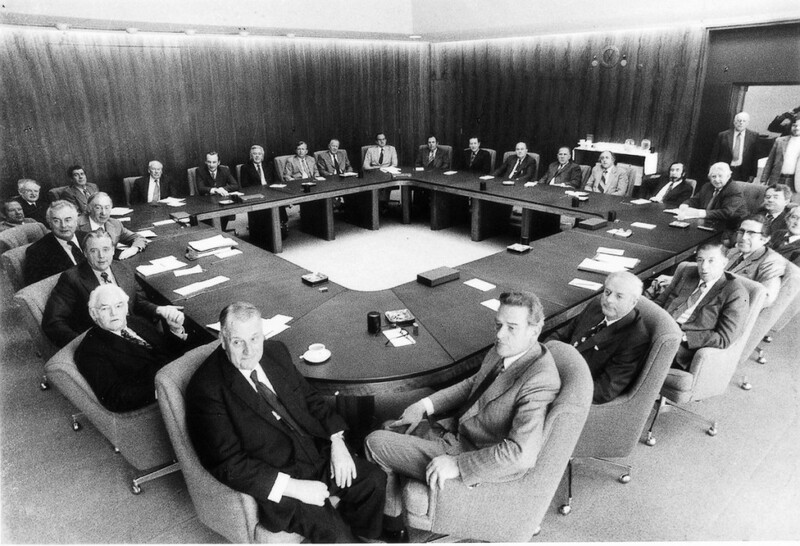 The third Gough Whitlam Ministry in the Cabinet Room, 1974. National Archives of Australia.